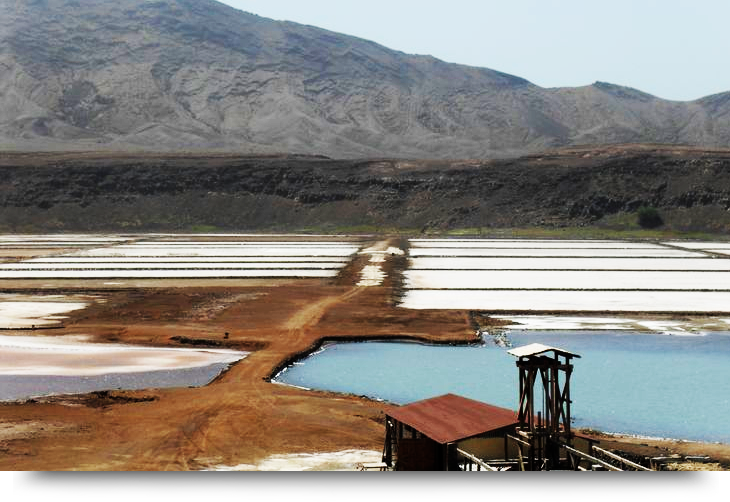 Cape Verde & Sal is well known for it’s salt mines which was the main industry on Sal and Cape Verde islands before the tourism started blooming. Salt mines are still being used on Sal, both the one at walking distance north east of Santa Maria town, and the most known one in Pedra Lume. Pedra Lume salt mine is the largest salt mine in Sal. Get here by guided tourist bus, rented car, moped or motorcycle. Pedra Lume is located about 3 km east of Espargos town, and 12 km north east of Santa Maria town. The salt industri is now in the past since Cape Verde islands and Sal are mostly living of tourism these days. But the salt mine in Pedra Lume is still a beautiful sight and a great tourist attraction. Some of the salt mines are still used in smaller degree. Inside the salt area you are allowed to bathe and swim in one of the ponds. Experience the sensation of floating effortlessly in the very salty water. The whole area is covered in white salt and well worth a visit. Just outside the salt mine is the small town of Pedra Lume. It is a very small town with a restaurant, a beach and a small harbor. You can also hike around this area of sandy dunes and get a better view higher up. Sharks are known to swim close to land near Pedra Lume. Read more in this article.